Russia’s national carrier Aeroflot has reported a loss of $50.7 million in its biannual report. The company points at the Russian economy’s general stagnation as the reason for the fall in financial indices, but analysts trace the roots of the losses to the shuttering of the company’s low-cost subsidiary Dobrolet due to EU sanctions. The Russian national carrier Aeroflot has shown a loss of 1.9 billion rubles ($50.7 million) for the first time in the last five years of its semi-annual reporting, according to the company’s biannual report. The company's net profit totaled 45 million rubles ($1.2 million) in the first six months of 2013. In its official press release, the slowdown of the Russian economy is cited as the key reason for the slump in performance. This is the first time the company, which started reporting on a biannual basis in 2009, has shown a loss since 2004. 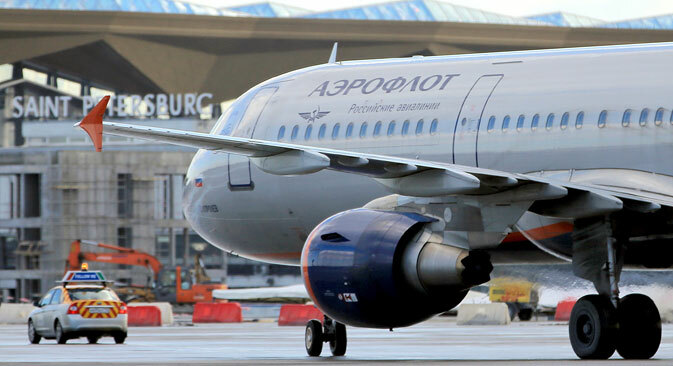 In contrast to net profit, which fell in the beginning of 2014, Aeroflot’s returns have gone up by 9.4 percent, reaching 140.3 billion rubles ($3.7 billion). The company explains the growth in revenue by highlighting the rise in passenger numbers and the fluctuations of the ruble against other currencies. However, this growth has not offset the rapid growth in operating costs, which have gone up by 15 percent to 141.7 billion rubles ($3.78 billion). Apart from this, as a result of the conflict in Ukraine the company was forced to cut the number of flights to certain destinations. "The profit index dynamics have been affected by the reduced frequency of flights to Kiev and Odessa, the cancellation of flights to Donetsk and Kharkov, and the change in traffic flow evaluation on flights to Simferopol from international to domestic [due to Crimea’s new status as part of the Russian Federation],” a spokesperson for Aeroflot explained. “The group’s operating expenses have been growing at priority rates, partially due to the jet fuel price hikes, its active expansion into new market niches, and a weaker ruble,” says UFS Chief Analyst Ilya Balakirev. The company also cites large one-off write-offs and provisions for payment of debts, he says. “They are obviously linked to Ukraine, perhaps to Dobrolet, which Aeroflot now has to rebrand as well as return the money for the purchased tickets,” says Balakirev. The subsidiary, launched by Aeroflot in June 2014 as Russia’s only low-cost carrier, had to close its operations due to the effects of EU sanctions imposed over the airline’s decision to operate flights to Crimea. According to Aeroflot, jet fuel expenses have grown by 8.9 percent as compared to the same period in 2013. This is due to the increased traffic volume, the expansion of its fleet and the launch of new routes, the company says. In the meantime labor expenses have risen by 13.8 percent, and other expenses including pilots’ training and certification have gone up by 45.9 percent, mainly due to the costs of recruitment and training of new pilots for the launch of Dobrolet. However, the company is not giving up on the low-cost flights model: Aeroflot plans to set up another budget carrier to replace Dobrolet, with operations to start at the end of October. The performance of other airlines, however, does not confirm the general downward trend on the Russian civil aviation market. For instance, Aeroflot’s key rival Transaero has delivered record profits of 750 million rubles ($20 million) in the first half of 2014, a growth of 61 percent, according to its financial statement. Transaero links its financial success to the “consistent focus on more cost-effective carriage routes, boosting cargo flights returns, the implementation of a cost-cutting program, and cutting commercial and administrative expenses,” according to a statement by the company’s press office. In the immediate future Aeroflot might receive financial support through the issue of additional shares. On 1 September, Russian President Vladimir Putin signed off a decree authorising the issue. The document sets the limit of state ownership at the level of at least 50 percent plus one voting share. The state presently controls about 60 percent of the company through various entities. The government had earlier planned to sell some 10 percent of Aeroflot shares in the second and third quarters of 2014. At the end of July 8-9 percent of Aeroflot shares were evaluated by the Russian government at $200-300 million. Nevertheless, the market players do not rule out the possibility that the biggest Russian carrier might show a return to profit by the end of the year. “Given that the second biannual report will cover July, August, September and also December, when traffic volume is usually driven up by the flow of holiday travelers, Aeroflot has a good chance to correct its statistics and produce a profit for 2014 overall,” says Dmitry Baranov of asset management company Finam Management.